Family bonds are supposed to be the tightest relationships that have ever existed. Then why is history full of family drama – fights, hatred, and even murder?! When a toxic family member is allowed to remain in your life, they will find a way to ruin everything that is good and beautiful. If boundaries are not clearly set, they can take a serious toll on the mental, emotional, and physical health of those who care for them. Sometimes, it will require a lot of strength on your part to distance yourself from certain family members – even if it means completely cutting them off. They are very judgmental. Family needs to know the difference between constructive criticism and a toxic judgmental attitude. Whenever you see them, do they always make rude and judgmental comments to you? If you feel that their “judgment” is based out of genuine love, you need to tell them that you appreciate their concern, however it is no longer necessary to talk about it. However, if they are consistently judgmental and mean, they are a toxic influence in your life. They are not trustworthy. Some family members pretend to be your “best friend”, so they can gain personal information to use against you if necessary. Other family members have problems with lying and stealing! If you feel like you can’t leave a family member alone in your home because they might steal something or search through your personal items, they are absolutely untrustworthy! They only talk to you when they need something. They’ll come back into your life, acting loving and positive! But the reason they are there is because they want something from you. Emotional comfort, financial support, gossip-ridden advice, etc. We all know that family member who is always trying to sell you something! *Insert eye roll* Once you give them what they want (or turn them down), they are gone. You are not important to them and they will always use you – if you let them. They will only help you if it somehow benefits them. If you go to them for advice or help, they will only help you if it benefits them in some way. Maybe it will make them look good in the eyes of others. Maybe they just want information about you, so they can spread gossip about your life. Or maybe they will encourage you to make a life-changing decision! But once you actually make it, they are nowhere to be found. At the root of all their “kindness” is a deep, toxic selfishness. They blame you for their mistakes. Do you have a family member who blames all their poor choices or unfortunate circumstances on someone else? Perhaps they blame you for their mental health issues, financial problems, family problems, etc. This is a cruel form of emotional abuse – a manipulative scare tactic to force you into doing what they want. They always try to make you doubt yourself. Maybe they are jealous of your success? Perhaps they don’t want you to ever look “better” than them. Whatever the case is, they never encourage you or support your dreams! They always tell you all the ways you are going to fail and how you should doubt your gut feeling and better judgement. Maybe your family member is just a pessimistic soul who needs your love. Or, maybe they are a toxic, jealous person who hates your happiness & success. They are always guilt-tripping you. You don’t support them. You don’t love them as much as you should! Your gifts are never big enough. Your efforts are always too small. You are rich, so you should give them money. EVERYTHING YOU DO is never good enough for them! You will never be enough. This toxic behavior can seriously hurt you – mentally and physically. They disrespect your partner. Is your family rude and disrespectful to your partner in any way? This behavior should NEVER be tolerated. Your loyalties are to your spouse – always! It is your job to protect their dignity, honor, and reputation. Toxic family can take a toll on your partner, often causing separation or divorce. If you see this toxic behavior, address it immediately! The list could go on, but these are the key signs of a toxic person! When a family member offends you, this doesn’t mean that you should cut them off immediately! Sit down and have a conversation with them about their behavior. You can even write them a letter, detailing your concerns. This is a very important step in showing you whether or not you should cut them out of your life. This is how the process works in normal family relationships. You sit down and talk about your differences and any offenses that may have happened. You patiently listen to each other’s points of view. Even if you believe the other person is wrong, you still need to listen. They acknowledge their mistakes and apologize for their behavior. Or, you acknowledge if you misjudged them or made a mistake. Even though feelings are hurt, you can both move forward and work on healing your relationship. You love each other, so you are willing to work things through! They get very upset and start blaming you for everything. They will say that you are overly-sensitive and childish. Your opinion will never be valid. They do not want to hear your point of view. They don’t care about how you feel because the relationship is all about them – not you! Their love is NOT unconditional. They will tell you that YOU need to apologize. One of the worst misunderstandings about cutting off a toxic family member is when people accuse the survivor (the one being hurt) of being bitter and unforgiving. Forgiveness and “cutting someone off” are two very different things. Usually, forgiveness takes a lifetime of effort. It may take a commitment every day to not hold onto bitterness against someone. When you make the difficult decision to cut a family member our of your life, you need to be prepared for people not agreeing with you. Again, there is this social stigma that families have an unbreakable bond and that they should always stick together! Unfortunately, you should never put you and your family’s mental & physical health at risk just to please other people. More than likely, you will be contacted by other family members who question your decision. Some of them will try to make you feel guilty for your decision. Others will simply caution you against making selfish decisions in the future. Regardless of their concern, you need to be strong and FIRM with your decision. Some people are willing to stay under the influence of toxic people for the rest of their life, always making excuses for their behavior. This is not you! Don’t let anyone walk over you and make you doubt what you know is best for you. 5.) If you are a Christian, the Bible talks about cutting people off! The Bible is full of verses about toxic influences in your life. When you are trying to deal with a toxic person, they will often guilt-trip you with these Bible verses. Unfortunately, they are twisting Bible verses to meet their own selfish agenda. To “turn the other cheek” does not imply that you should consistently place yourself in unhealthy situations. Forgiveness – YES! Unconditional restoration – NO! Below are just a few Bible verses about separating from toxic people. For more information on this topic, please read the article mentioned below. Related Articles: What Does The Bible Say About Cutting People Off (Going No Contact)? Recognize that person is not going to change. If you have taken the proper steps of talking to them and they continue to be toxic and damaging, you must identify that they are not going to change! Your forgiveness, kindness, and long-suffering will not change who they are. By allowing them to remain in your life, you are putting yourself (and your family) in the position of continued abuse. Remove them from social media. This is absolutely not a passive aggressive or childish move! Your social media is the key place that they will gather information about you, so they can gossip and spread rumors. This will also remove easy access to you and your family. If necessary, block their number. If your family member is narcissistic, they may be unrelenting at trying to contact you. Narcissists do not like to be cut off! If you continue to receive guilt-ridden texts and toxic voicemails, you may need to block their number. Giving them any point of easy access to you may destroy your attempt to go “No Contact” with them. Do not talk negatively about them to others. If you talk bad about them to others, you are not allowing yourself to move forward. Not only is this wrong, it will also resurface your resentment towards that person, causing you unnecessary anxiety. Choosing to remain silent on the subject to those who do not need to know will help you to mentally move beyond the toxic situation and towards healing. Stand your ground and move forward! As time goes by, don’t allow sympathy or regret to change your decision. Toxic people are often very perseverant, so don’t allow them back into your life based off a belief that they may have changed. If you are a compassionate person, you may find yourself making excuses or rationalizing that person’s behavior. True change is proven over time through consistently changed behavior. (They need to earn a place of trust back in your life). This doesn’t mean that your relationship with that person will get better. This means that YOU will get better. 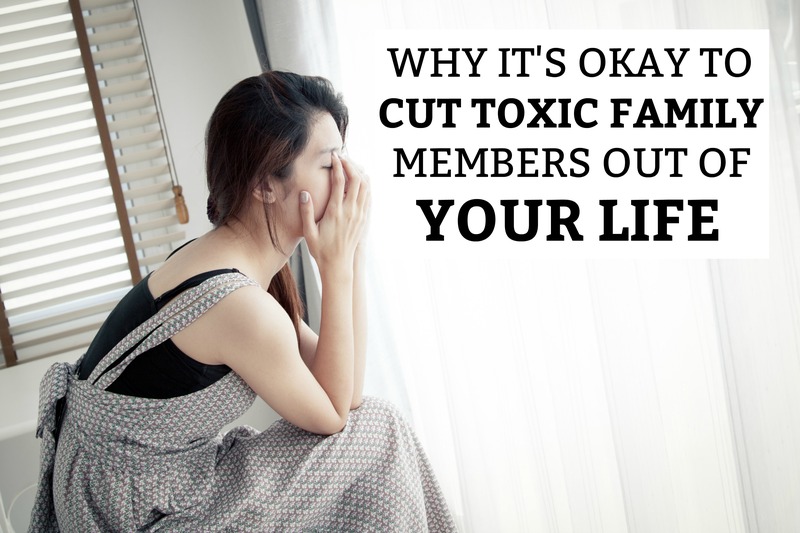 Right now, you may think of that toxic family member all the time. They may have hurt you so badly that you can’t stop thinking about them! Just know that letting go and closing the door to that relationship is just the beginning of your healing process. Perhaps you need to go to therapy! NEVER be ashamed of accepting the fact that you need a therapist. Professional therapy can do a world of good – and start you on the journey towards mental healing. As time passes by (and you remain consistent), you will start to think of them and their toxicity less and less. As you distance yourself from toxic influences, you will notice a HUGE CHANGE in yourself. You will start to regain your confidence and excitement for life! You will even start to see that toxic family member in a different light. Your frustration will turn to pity – for all the wonderful things that they have forced out of their life. Putting up a permanent boundary with a family member can be one of the most difficult decisions of your life. But when someone refuses to take responsibility for their actions and continues to act as if nothing is wrong with their behavior, they cannot be allowed to stay in a place of influence in your life. Great information. I needed those scriptures especially. Thank you! So happy to hear this, Vina! Take Care – Caroline.